Breaking today, introduces Krispy Kreme’s newest sweet round thing, called the “Nutty Cocoa Ring, topped with Nutella®,.” The campaign is by advertising agency Baldwin&, Raleigh. 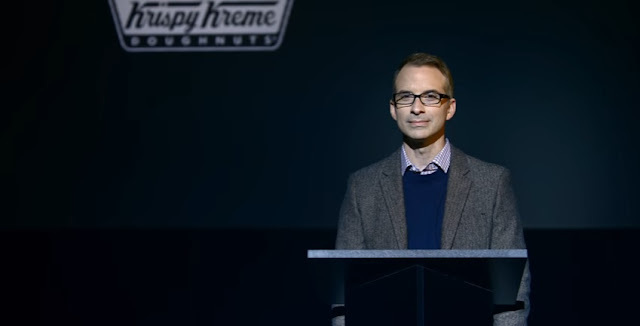 After an introductory title card that promises, “a special announcement from Krispy Kreme,” the video cuts to a darkened, corporate-style stage with dramatic music, flashing spotlights and smoke effects. A speaker takes the podium. His only words: “We have a new doughnut. It has Nutella on it.” The spot is hashtagged #EasiestSellEver . Paid digital support via Baldwin& includes: YouTube TruView skippable :30 pre-rolls plus “Bumper Ads,” a new :06 YouTube format; traditional banner advertising; and “content amplification” native advertising. Additional paid social support via Krispy Kreme, includes Facebook, Twitter, Instagram and Google Adwords. The “Nutty Cocoa Ring, topped with Nutella” has one half sprinkled with hazelnuts, and the other drizzled with more Nutella. It is available at 322 U.S. Krispy Kreme stores, across 41 states, Alaska to Florida, plus D.C. Krispy Kreme Doughnuts, privately held, is based in Winston-Salem, N.C.